What matters isn’t what you think should happen, it’s what others think will happen that counts. Funny days these, the world seems to be constantly turning upside down. 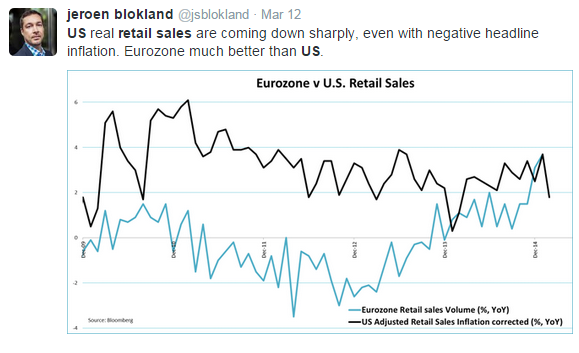 I could be talking about the arrival of negative interest rates in many European economies, but I’m not. What I have in mind is the crossover that seems to be taking place in the perceived fortunes of the US and the Euro Area economies. At the end of 2014 it was all “Europe bad, USA good” to the point that most observers were expecting an imminent rate rise from the Federal Reserve, even while the Euro was in such a bad state that ECB was being steadily pushed – kicking and screaming – towards a full blown programme of sovereign bond buying QE. But now, only 3 months into 2015 everything is switching round, as investors become increasingly bullish of the Euro Area recovery outlook, even while doubts on prospects for the US continue to mount. To take just one example, US retail sales fell for the third successive months in February (whatever happened to the boost from lower gas prices?). 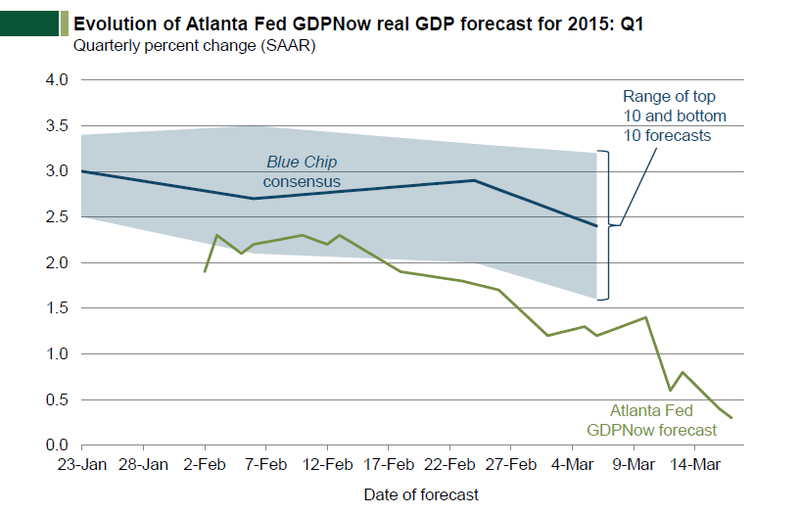 Indeed such has been the flow of negative data in the US that the Atlanta Fed GDPNow indicator has been steadily sliding downwards, with this weeks projection for Q1 2015 reading coming in at a measly annual 0.3%. Well if the actual result is anything like this one, just get ready for all those Euroland overtakes US headlines. One of the most striking features of this turnaround is the way the the trend in the Citigroup Economic Surprise Indexes has inverted. 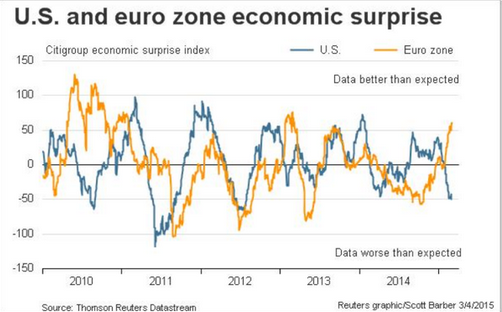 These indicators measure economic surprises for the US, Europe, Japan etc. in terms of whether data exceeds or falls short of consensus expectations. The Indexes weight selected economic indicators based on their influence on movements in the foreign exchange market on the day of their release. The standard deviation of the actual release from earlier economists’ estimates are used to calculate the weights. The final indicator represents a three-month average of the raw daily figure. Such indexes are quite useful as they give some sort of “soft” reading on whether economies are accelerating or decelerating at any given moment in time. If surprises are tending to the upside this means that (by-and-large) data is coming in better than the economists models forecast, and vice verse if the opposite is happening. Models base their expectations on historic data, but each moment in time is unique, so deviations from model predictions do have some meaning. And if these deviations follow a pattern, then they can give you a reading on the state of play of the business cycle. Well, if we turn to the current trends in the US and Euro indexes, we get an interesting “surprise”. 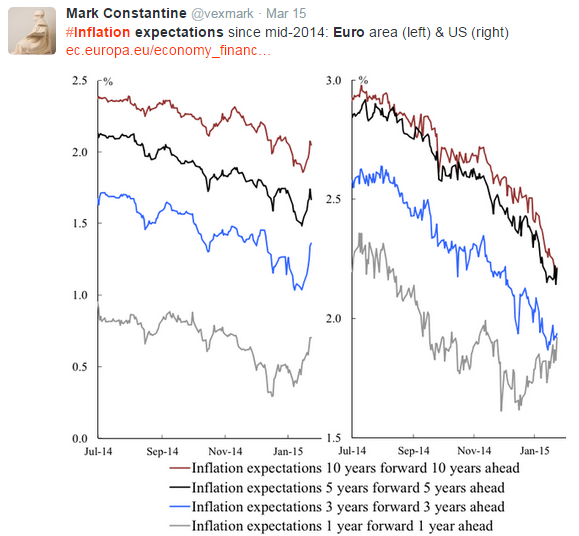 Euro Area inflation expectations have even started to rebound, even as their US equivalents keep falling. So When Does The Taper Debate Begin? In theory it is the intention of the ECB governing council to continue the 60 billion Euros a month bond purchase programme until September 2016, but as became clear in the Q and A session which followed the last meeting, this “intention” is in part data dependent. A point which has been forcefully hammered home in an interesting recent article from the FT’s ECB correspondent Claire Jones – Euro plunge tests ECB inflation forecast. Claire Jones (FT): What are the core inflation forecasts based on? Is it due to the bounce back in oil prices, or, now that you’re more bullish on the economy does it reflect this? Mario Draghi: Our monetary policy decisions have stopped a decline in inflation expectations that had started at the end of July last year…. It is true that, as you said, our projections of inflation are based on oil price futures, but also there are other factors, which play a role for core inflation. One is, of course, our monetary policy stance, and its effects on the exchange rate. The second one is the closing of the output gap, that we foresee happening gradually between now and 2017. 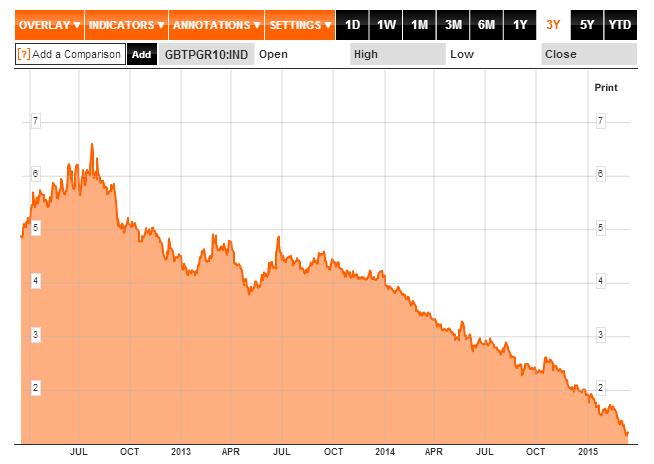 “The ECB has welcomed the euro’s depreciation, which should provide a much-needed boost to the eurozone’s exporters. But a sustained weakening could lead hawks on the governing council to ask some awkward questions about whether policy makers were right to keep on buying €60bn-worth of public and private sector bonds a month. “With inflation forecast to reach 1.8 per cent by 2017 the ECB is heralding QE a success less than a week into its launch. However, under an alternative scenario outlined in the projections, a much weaker exchange rate would probably lead the ECB to miss its target, with inflation likely to rise above 2 per cent by the end of the forecast horizon. The trouble is that the alternative scenario is already in danger of being realised. Under it, the euro is projected to dip to $1.04 by 2017. If the single currency continues to plunge at the pace it has done over the past five days then it would reach that level early next week. The next batch of forecasts are not due till June, but already some of those who would favour earlier termination are out there testing the water. In fact Governing Council member Bostjan Jazbec, who represents Slovenia, was arguing it could end early one month before it started. “I understand it this way …Once the price mandate is fulfilled, we can end it earlier,” he told the Wall Street Journal on 5 February. Marcel Fratzscher, who is not on the ECB board, but who – as Director of the DIW economic institute – has an influential voice in Germany, agrees. 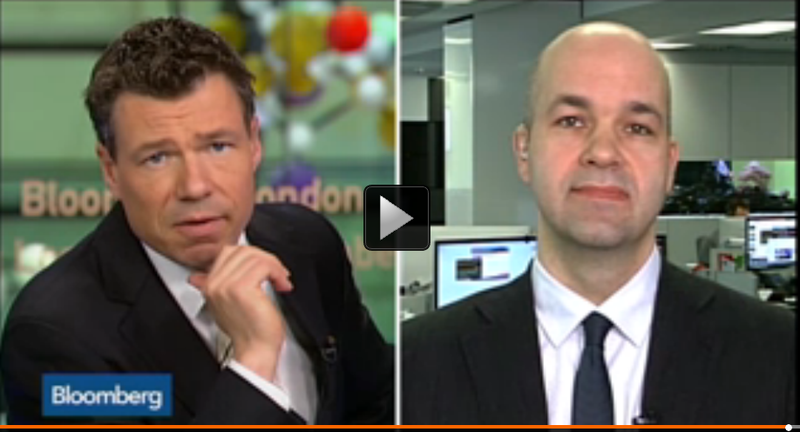 “The idea [in Germany] is that the ECB has been doing too much, and should really try to taper the programme rather sooner and before September 2016”, he told Bloomberg TV on 16 March. The fact that Mario Draghi was able to convince his Governing Council to introduce QE on March 5 surprised many observers, who expected Germany to put up more resistance to the idea. In order to get it through the ECB the policy was explicitly tied to the mandate: maintaining price stability. This is the only meaningful objective of QE – not unemployment, not growth – and presented in this way (as Mr Draghi pointed out) not going ahead would have been illegal. But, in this life, things that come easy are just as easily lost, so the low bar on entry will mean there is also a relatively low one for exit, and as Claire Jones suggests the tapering debate could start as early as June, especially with the Euro Area economies looking likely to outperform in the coming months. The problem – as we are seeing in Japan where it looks like they are about to fall back into deflation again – is getting a short uptick in inflation through currency devaluation is one thing, and solving a problem of deep structural deflation is another. If Europe’s first brush with deflation is connected with its demography and declining working age population – as I argue here – then any tapering that does take place in the purchasing programme won’t be the end of the matter, and the bank will probably be forced back into buying again soon enough. In addition Europe’s present recovery is cyclical, but long term structural impediments to growth remain, so don’t expect the wonders to last. But one thing at a time: you will hear growing talk of ECB tapering as the months pass, and the only real unknown as far as I am concerned is how exactly periphery government bond markets will react to the news. Pingback: Should we listen to Ray Dalio? Should we taper? Be patient? Mark, thanks for drawing my attention to this. Does Krugman disagree with me, I don’t think so. When he says, “And you know what will be coming next: claims that this (a) vindicates austerity and (b) shows that there is no reason to worry about Japanification.” I think this is exactly what I am talking about. The opponents of QE, and those who don’t understand the gravity of the Euro countries situation will use the positive economic data and the inflation mandate of the ECB to try and taper. Market traders will also get in on the act, betting whether or not it will happen. Will there be tapering, I don’t know. Everything depends on timing – and will there be a Greek exit – but there will be an attempt to implement it, that was all I was saying. Really, I think we are saying more or less the same thing, for good or ill.